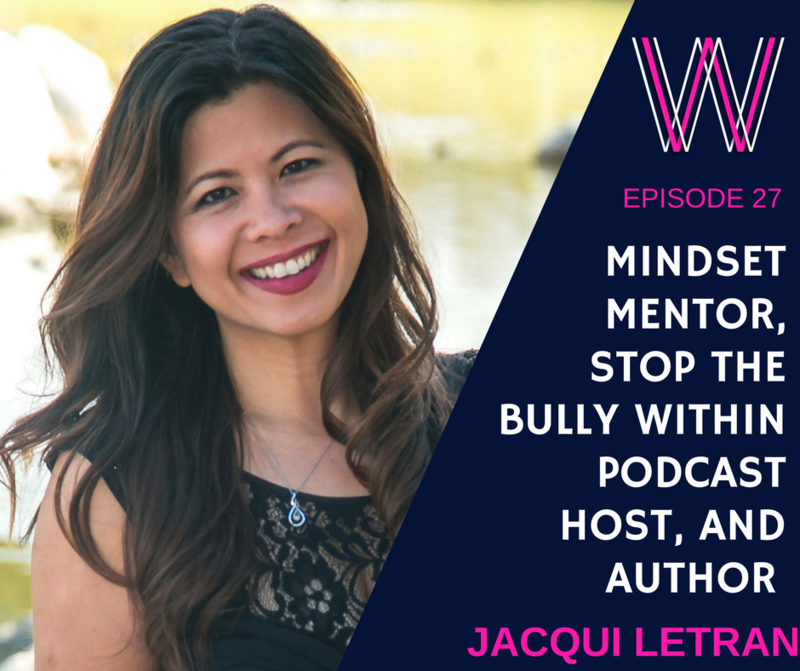 Jacqui Letran is a Mindset Mentor, award winning author, and host of the Stop the Bully Within podcast. She shares her journey from a 16 year old teenage mum to the owner of her own business helping adults and teenagers. We discuss her self-publishing journey, and the work she does to help people change their mindsets. Lisa Linfield: 00:13 Hello everybody, and welcome to this week’s episode of Working Women’s Wealth. Today I’m joined by Jacqui Letran. She is a mindset mentor, and she works with clients of all ages, but she has a specific passion for helping teenagers and young adults. She is the author of three award-winning books, and is also a podcast host of a podcast called Stop the Bully Within. Thank you for joining us today, Jacqui. Jacqui Letran: 00:49 Thank you so much for having me on today. What an honor. Lisa Linfield: 00:52 We are really interested, well, I’m really interested in hearing all that you have to say, because one of the things that I’m learning in life at my very old age is that the real key differentiator in success is how you think. I was just reflecting on your journey and I was wondering how on earth did you get into this field, and especially working with teenagers? Jacqui Letran: 01:16 Okay, so I started off as one of those teenagers that desperately need help, and I didn’t know where to go for help, and I didn’t have enough confidence or self-belief to actually seek help anyway, looking back. But I started out as a very depressed, very anxious, very angry teenager, and I did everything wrong. By the time I was 16, I gave birth to my son. Jacqui Letran: 01:40 I dropped out of school, I was on public assistance. So my life started off, you know, taking off really fast in terms of not the best route, and at 16 I went downhill big time. But also at the same time, that is what saved me, and that’s what got me started on my journey because I remember the first time I looked into my son’s eyes. And I’m getting a little bit emotional because I talk about this moment quite a bit, but I still love it so much, and that is the first time I look into my son’s eyes, I felt this immense love that I’d never experienced before. Now, that doesn’t mean my parents doesn’t love me, they love me in the best way that they can, but I wasn’t able to feel that love because I felt I was unlovable and undeserving and unworthy of life, and so I couldn’t receive that love from my parents, but when I looked into my son’s eyes, I felt it, and I felt it to core of my being. And in that moment, I knew that I had to do something different. I had to be the person that would be so deserving of this little baby’s love. And so that’s where my journey all started. Lisa Linfield: 02:52 That’s fantastic. And then what happened? Jacqui Letran: 02:55 A lot of struggle. I would love to say, “I decided to be better and I woke up better.” It didn’t quite happen that way. It was a very long and very painful journey because my mindset at that point, again, was that I’m unlovable. Something is completely wrong with me, that I’m not worthy. And so, whatever mindset, whatever belief system you have, is how your mind will screen out your experiences. So if I walk around thinking I’m unlovable, any act from other people that show me that I might be unlovable, I’m going to be hyper- focused on those things. And when people are showing me affection, it doesn’t match my belief system, so it feels really uncomfortable and I might try to push it away or I might not even hear those kind of things. So my journey started with reading. I started reading every single self-help book I could. And even prior to this journey, books were my friends because I was such an angry teenager, and I would explode and I would bully other teens when I felt bad, and so I didn’t want to be that way. So I started escaping to the library at school and read anything I could get my hands on, just to escape my reality. But those books weren’t self-help books back then, until I had my son. Once I had my son and decided I needed to learn how to like myself, that’s when the journey with the self-help books began. Lisa Linfield: 04:21 And you are now a couple of years down the line, your son is married, you have written three books that aim to help teenagers. How did you get to the stage of angry teenager to raising an amazing young human being, having a really successful business and writing three books? Jacqui Letran: 04:41 A lot of it definitely was, once I learned how to understand my mindset and how to take control of my mindset, I was able to achieve a lot of what I was able to achieve. And a lot of it is pure luck. I’m not going to lie. I was blessed with a very easy son to raise. I was 16 when I had him, had no clue how to even be me, let alone parent a child, and I was blessed with this amazingly easy, happy-go-lucky child who helped me transform myself too, through his attitude and just his energy. But I went from dropping out of 10th grade to going back and getting my GED, which is the high school equivalency degree, or I guess I test for that, and then going straight into college, because I knew that I wanted to break this poverty cycle that I was in so I can provide for my son. So I went into school, got my nursing degree, got my master’s in nursing and started being a nurse practitioner at 23 years old. I practiced medicine for a really long time, I believe like 17, 18 years, and then I got discouraged. I got discouraged because I kept seeing the same patients over and over and over again. You know, I was seeing a lot of teens for mental health issues, and reproductive health issues. I recognized I was prescribing medication to the same patients and I got really disillusioned. I got into this field because I wanted to help people, and what I was recognizing is, I wasn’t really helping people to the core. I was helping them mask the symptoms and surviving instead of thriving. I did not like that, so I started looking for other options, other ways I could help my patients, and discover a bunch of different holistic options, like hypnosis and NLP and EFT, and those are all processes that works on the subconscious part of the mind. Now, coming from a very science-based background, I totally did not believe in any of that when I first encounter it. In fact, I thought it was only for crazy people, right? I mean, like who does hypnosis? But the more I look into it, the more I fell in love with it, and I loved it so much that I actually gave up practicing medicine and started a holistic practice about eight years ago. The way the book came out was, I never wanted to be an author. In fact, my grammar is horrible. My tenses are off and I’m just not good with grammar. However, with every single one of my clients, the first or the second visit I would go pretty deep into their mind. How their mind works, and how they can start taking control of their thoughts and feelings. And I would get the same request, and that is, “Can you please write it down?” They’re like, “There’s so much good information right here. Please write it down for me.” And I’m like, “I can’t write that. I spoke for an hour.” So as I kept getting the same request, I decided okay, it’s time to write a short PDF and help the clients out. As I started writing, I’m like, “Oh, wait. There’s more, and more, and more.” And next thing I know, I had a book. Lisa Linfield: 07:47 And you self-published this book. How did you do that? Jacqui Letran: 07:51 I self-publish … you know, the first part of it, it was because I started looking into options, traditional versus self-publishing. With traditional publishing, first of all, the biggest barrier for me or for my particular wishes, was that it takes too long from the time you submit to the time it actually get published. A year is usually pretty average, and I did not want to wait a year to get my book out there. So I started researching more on what can I do, what other options I have, and there are just so many wonderful, free resources online, so I consume as much as I can, and it was actually a very easy process. I use KDP with Amazon for the ebook, and I use CreateSpace for the physical book. The tutorials makes it incredibly easy to get your stuff out that. Lisa Linfield: 08:40 Wow. So you write the book, you self-publish, and then what goes through your mind? In the beginning, the reviews were very positive. I’m going to take one step back. I’ve learned through all the free resources online how to launch my book properly. And so when I launch my book, I launched it to the number one bestseller within the first couple of hours of my launch. Lisa Linfield: 09:39 Wow, that’s brilliant. Jacqui Letran: 10:49 It shook all of that negativity and all that pain off, and I was able to read the review again with more of an objective eye, and I learned a couple things on how I could improve my books … my book at that time. So that was actually quite helpful. Lisa Linfield: 11:06 You then wrote another two books. Jacqui Letran: 11:35 … within a couple of hours. But there was a reason why I didn’t mention the first book. Jacqui Letran: 11:43 I’m going to be completely raw and real because you know, I think people need to understand that the journey might not be as beautiful and as perfect as it seem when you’re outside looking in. So when I learned that I needed to have two books, I’m like, “I don’t have two books in me.” And so what I did was, I took an article that I wrote, and I beefed it up a little bit to launch as my first book, so I was never super proud of that work because it wasn’t authentic to who I am as a person, and to my work. I did what the gurus said to do, right? And so I threw it out there, and because of the marketing and all of that, I was able to hit number one, but I was never super proud of that book. So, a year or so after that, I’m like, “You know what, the contents of the book is good, but I really need to add more to it to make it a real book, a book that I can be really proud of.” So I rewrote it and re-release it and now I have three books I’m very proud of. Lisa Linfield: 12:43 Oh, wonderful. That’s a great story. That is really a good story. I think it’s about the journey of being true to yourself. And yes, you did actually release it, but in striving for the best, you kind of made it better. Lisa Linfield: 13:20 It is. Absolutely. So, you launched this podcast, Stop the Bully Within. It sounds so easy, but you know, the challenge of life is that for me personally, I believe that the biggest battle in life is not out there in the world, it’s the battle of your mind, and the voices that tell you that you’re not good enough, and the voices of fear. So, how do you stop the bully within? Jacqui Letran: 13:47 I wish I can tell you how to do that in one sentence. It’s not as easy as that, but it is easier than a lot of people think, and if I was to give an easy answer, the easy answer would be, it’s all about your mindset. It’s really about how you think. And you might wonder, “Okay, so I’m thinking all these horrible, negative thoughts, and that’s my mindset, so how do I overcome that?” The reason I started the podcast, Stop the Bully Within is because of my experiences with my clients. As I’m working with my clients, they’re talking about the external bully, they’re talking about the trauma, they’re talking about all these people hurting them, and abusing them, all their failures. What I recognized was that every single one of my clients had one theme in common, and that was, they were their own biggest bully. You know, because if you are bullied outside, and people call you name, and push you down, and all of that stuff, if you don’t internalize it, and if you don’t repeat the same words to you, the effect of the bully is very minimal. It’s when you take their words, you internalize it, and you say, “Oh my gosh, they’re right. I’m a loser. I’m a nobody. I’m stupid.” That’s when it becomes a big problem. The way that I teach it, is that the internal bully is not as bad as we think. Because when we think about all those negative things we say to ourself and we beat ourself up more for saying those negative things, we think that this internal voice is completely evil. Well, the way I teach it is that your inner bully is really your bodyguard, and your bodyguard’s job is to keep you safe from any real or perceived danger. But your bodyguard can’t really differentiate between what’s really happening right now versus what happened in the past. All your bodyguard does is this knee-jerk reaction. It saw that in the past with this particular event, you got hurt, you got rejected, you got embarrassed, and it doesn’t want you to reexperience that kind of pain again, so anytime you go into a situation that sort of, kind of look like that previous event, your subconscious mind, which is your bodyguard, will freak out and do everything it can to protect you. Now, unfortunately, it learned that all it has to do is scare you a little bit. All it has to do is bring in some doubts. And when you’re scared, and when you have the doubts, you stop what you’re doing and you go back to where you were in that little safe box. So when you recognize that that internal voice, that inner bully is really trying to protect you and not harm you, then it’s a lot easier then to work on transforming that voice from a voice of negativity into a voice of positivity and support for yourself. Lisa Linfield: 16:33 You mentioned that there are four secret weapons to do this. What is that? Lisa Linfield: 17:26 How do you overcome each of those four? I mean, those absolute types of words. And so when you start recognizing that you’re talking to yourself in a way that you would not talk to your best friend or someone you love, that’s your inner bully speaking. If you recognize that you’re talking to yourself in a negative way and using those absolute words like never, always, nobody, that’s your inner bully talking. So you have to challenge it. You have to stop it in that moment, rather than allow that thought to continue. The first thing I teach to my clients is just being aware. You know, the first week they don’t even have to do any changes. Just being aware. Take a notebook around with you. Write down every single instances that you’re saying harsh, horrible things about yourself, and you will be blown away how often you actually do that. So once you recognize that you are in fact doing this quite often and some of the themes that you might be saying, then when you start hearing yourself talk that way, you have to challenge it. For an example, if someone often say to themself, “I’m so stupid. I never learn.” Well, question that. Are you always stupid? Can you think of times where you actually were neutral? Or times where you actually were very smart? And the statement of, “I never learn.” Is that really true? Have you never learned anything new in your life? Or are there a bunch of different things that you can think of that you’ve learned and even mastered? So when you start really looking at it that way, more objectively, you’re going to recognize, “Wait, I’m not that person that I think I am.” And then using affirmations, using positive talk to yourself, because whatever you say to yourself, you’re basically telling your mind, your subconscious mind, “This is who I am, this is the experience I want, give me more of this.” So if you walk around saying, “I’m stupid and I never learn,” you basically tell your subconscious mind, ” Look for evidence to show me how stupid I am. Look for evidence to show me that I never learn.” And of course, whatever you look for, you will find evidence of. One way to combat that, if you have the belief of, “I’m not good enough,” is start working on changing that dialogue to, “I am good enough,” and practice that over and over and over again. In the beginning when you have a belief of, “I’m not good enough,” and working on an affirmation of, “I am enough,” it might feel like a big stretch. It might feel like a big lie. So if that is you and you’re saying the statement and it doesn’t feel right with you, you can soften that statement up to, “I’m willing to be good enough.” Doesn’t that feel differently already from, “I am good enough,” to “I’m willing to be good enough”? Jacqui Letran: 20:52 Just softening that statement that way can ease your mind. It might make you feel more aligned with that statement, and if you’re comfortable, fantastic. If “I’m willing to be good enough” is still uncomfortable, you can soften up even further with, “I’m willing to know it is possible for me to be enough.” Now, can you really fight that statement? Jacqui Letran: 21:17 Your mind won’t either because your mind is really open, it’s always willing to know something is possible. So start wherever you need to start and keep building it up, keep using that same phrase and imagine what that looks like to you. Imagine how that would feel, imagine how you would respond to people and how they would respond to you when you are that way. And you do that over and over and over in your mind, and that’s how you start the rewiring process. Lisa Linfield: 21:46 So, you suggest that you can rewire your brain. There’s a part of me that, one, if you’re not born that way, you know, that people I’ve learned since I was little, who … I love the Winnie the Pooh analogy of people who are Eeyores, people who are Piglets, bouncy and positive, people who are Tiggers, who are all over the place all the time, and then people who are Pooh Bears and just kind of going through life. There were Eeyores, and there are Eeyores still. Do you believe that you can come from being Eeyore to being positive Piglet? Jacqui Letran: 22:24 Most definitely, and I am an example of that. If you knew me when I was a pre-teen and a teenager, and then you know what I’m doing right now, and how I live my life, you would be like, “Those are two incredibly separate people.” I was, like I said earlier, a very angry person, and I bullied other people. And now I’m Miss Happy-Go-Lucky, helping people overcome their inner bully. Lisa Linfield: 22:48 Is there a morning routine that you do, or that you recommend to people? Is there kind of a recipe or formula? Jacqui Letran: 22:59 I don’t think there’s anything that is one size fit all, but let me go back a little bit to rewiring the mind. I think there are some things that are important that we need to talk about. When you’re looking to rewire your mind, most people will have a hard time doing that because a lot of the beliefs are hidden, and they are buried so deep that it’s hard to get to. So professional help is very critical for a lot of people. So depending on where you are and what you went through, and what you make those stories of what you went through means, you might need that professional help to discover those underlining beliefs and then transforming it. If you are in a place of doing pretty okay, and you need to have more positivity, you need to have more courage, more confidence, then a lot of that you can do on your own. Does that part make sense so far? Lisa Linfield: 23:53 Absolutely, yeah. Jacqui Letran: 23:55 Yeah, so rewiring definitely can happen, and the level … how quickly you can rewire your mind really depends on if you have professional help or if you do it on your own. I mean, just think like anything else. If you have a project that involves some kind of machinery, and you’ve never used that machinery before, but you have a manual, you can read the manual. You can figure it out. You can eventually work that thing. But if you have somebody who’s an expert and say, “Well, this is what you do,” and show you what to do, and correct you when you’re not doing it quite as good as you could, then that process becomes much easier. Then going back to the other question, which I completely forgot, what is that question? Lisa Linfield: 24:38 What routines do you do every day? Jacqui Letran: 24:41 Oh yes, routines. One of the things that I love is how much energy and joy there is in my house. So space and the energy within my space is very important. I believe if you have a very clutter space, it’s very easy for your mind to also be clutter. So my bedroom, there’s not a whole lot of stuff in there. There’s just the stuff I really enjoy. So the first thing that I do when I wake up is, I’m in this place of peace and serenity. I’m already starting my day that way. I am a huge animal lover. I have three cats and a dog, and they like to wake me up. And so I get to wake up with these tiny little furry faces right there in my room, and that makes me really happy. Now for my clients, what I do with them, usually on the first visit with me, is I help them create what I call a masterpiece. A masterpiece is a vision of you the way you truly want to be. One way to look at that is that this masterpiece is your GPS system for life. So we create very specific, very detailed what this masterpiece look like. I recommend that clients, before they even get out of bed, that they work on their masterpiece. And I usually have them record the masterpiece with long pauses in between each sentences, because when they listen back to their masterpiece, during that long pauses, I want them to live out that statement. So for example, if you start out with, “I’m happy and confident,” during that pause, how does that look like to you? How do you know that you’re happy and confident? Again, what are you saying to people? What are they saying to you? How do you look? How do you feel? What are you doing? Bring all of those in, and then the next statement, do the same, next statement, do the same. You live your masterpiece so vividly in your mind because here’s the trick. Your subconscious mind, the part of the mind that you’re looking to transform and rewire, it doesn’t know the difference between a real event or an imagined event. To your subconscious mind, it’s the same if you think it, if you feel it, if you do it. So in bed, you know, you’re just living this beautiful masterpiece, something you truly want, something that excites you, and you have all these wonderful, feel-good feelings. And your subconscious mind doesn’t know that you just imagined it. All it know is that all of these statements that you thought about align with you and it feels good. The more time you do that, the easier it becomes, the more your mind will take it as this is who you are. And then you’ll see that transform. One of the reasons I recommend doing this in the morning is because routines are really important, but also because we tend to have negative routines. Most of us, the first thing we do in the morning is, “Oh my god, there’s so much to do and I’m already running late, and I don’t want to get out of bed, and I have that meeting.” We put ourself into this stressful state before we even get out of bed. And all of that I just mentioned right now is also a masterpiece. It just happened to be a negative masterpiece that we practice every single morning. So instead of focusing on all those negativities, I help my clients shift them into what they truly want, and what they truly want to create in their life. Lisa Linfield: 28:13 So I’ve created a masterpiece and I live this every morning. What do I do during the day? Lisa Linfield: 28:23 [crosstalk 00:28:23] real life takes over and things happen. Jacqui Letran: 28:25 Right. Real life takes over, and things happen and it is your choice in how you react to it. You have no control on what happens in your life externally, so even with the absolute best attitude and you are just there being loving and helpful and giving, and you will still have those Negative Nancys out there that will try to tear you down, right? And in those moments, you have a choice. You can either allow that person to control how you think and how you feel and ruin your day, or you can recognize that their actions is about them, and you have the power to stay who you are and stay focused on yourself, and it does get easier. But in the beginning, one of the things that I teach all of my clients is how to stay calm. Because it’s easy to get wrapped up into the stories of things, but if you are able to stay calm, you can look at the situation for what it really is and react from that space, versus allowing the story to overwhelm you and take you into a negative space. Lisa Linfield: 29:29 So how do you stay calm? Jacqui Letran: 29:31 You stay calm by focusing on calm. So what I teach is that you are the boss of your subconscious mind. Whatever you tell your subconscious mind you want to experience, your subconscious mind will deliver that to you. So bringing back that person who is invading your space and making you feel negative, a normal reaction or a typical reaction would be, “Oh my god, this person is horrible and now she just ruined my day.” Well, no she did not ruin your day, not if you don’t give her the power and the permission. So this person is invading your space and you’re start noticing that you’re getting tense or you’re getting upset, instead of focusing on that negative aspect of it, start re-focusing your mind. The first thing I want clients to do is recognize their emotion. So if this person is invading your space and you’re feeling anxious, the first thing you want to do is recognize that you are feeling anxious. Don’t pretend, because if you pretend that you don’t experience this thing, it will grow bigger. So recognize you’re anxious, and say in your mind, “Even though I’m anxious, I choose to be calm.” Say that statement three times. “I choose to be calm. I choose to be calm. I choose to be calm.” And then after that, go into, “I am calm. I am calm. I am calm.” Keep repeating, “I am calm,” in a calming voice to yourself. As you’re repeating, ” I am calm,” in that calming voice, in your mind, imagine yourself doing something that calms you down. So for me, I love hiking. When I do the “I am calm” statement, I imagine myself hiking in some of the beautiful places that I’ve been blessed to hike in. That re-focus your mind, because basically what you’re doing is this. You’re telling your mind, “Even though I’m anxious, I choose to be calm. Calm looks like this. Give me this experience.” You just gave your mind a very simple command. You stuck to one thing and your mind can follow that really easily. Lisa Linfield: 31:38 That’s amazing. So, when I’m doing something major, speaking in front of 5,000 people for the first time, what do I do? Jacqui Letran: 31:50 Are you nervous? Lisa Linfield: 31:51 I’m terrified. Jacqui Letran: 31:53 The first thing is … okay, you’re thinking, “Oh my gosh, I have to speak to all these people and I’m terrified.” First off, what command did you just give your mind? Lisa Linfield: 32:03 I am terrified. Jacqui Letran: 32:05 I am terrified. Give me more reasons to be terrified. Show me all of those faces staring at me and judging me, because I want to be terrified. That’s what you told your mind. Or at least that’s what your mind heard you say. And that’s exactly the experience you don’t want to have. What experience would you like to have instead? Jacqui Letran: 32:26 So you can definitely do the “I am calm,” right? And you can practice that, but that alone is probably not going to be enough. What you can do is what I mentioned earlier, is that your subconscious mind doesn’t know the difference between a real event or an imagined event. So if you’re in your mind and you’re imagining yourself stepping out on stage, feeling confident, feeling calm, feeling powerful in your body, feeling powerful in your knowledge, imagine yourself looking out on the stage and people are excited to see you. They’re here because they want to hear what you have to say. Notice how good that feels. Imagine yourself making eye contact, smiling at the audience, projecting your voice, being powerful in your voice, being confident the whole time. Imagine yourself completing that presentation. You know, maybe it’s the Q&A section. People are asking you questions and you’re just like on top of your game, you’re answering all the questions perfectly. Or you might stumble in your word, but you recover very well. Imagine people applauding, giving you a standing ovation. Now, you practice that in your mind 20, 30 times, over and over again. And the key part is, and feeling good about it. If you feel good about something that you’ve done, your subconscious mind again will believe it really, truly happened, and if you perform, or you deliver that speech 20 times incredibly well, would you be nervous the 21st time you have to give that speech? Jacqui Letran: 34:02 No, right? Your mind doesn’t know that, and your body is in tune with that because you’ve been practicing it. Most people, they practice the opposite. “Oh my gosh, I’m just so nervous. I’m going to stumble on my words, and I’m going to forget what I’m going to say and I can’t look at people, and it’s just too much.” That’s the exact same thing as practicing the positive. So the thing is, your mind will either focus on the negative or the positive. The choice is yours. You are the boss. You get to choose. Lisa Linfield: 34:33 So you help all different adults, children, everybody, but you’ve chosen to focus on teenagers. For me, with a ten-year-old about to embark on that journey, I have to say it does scare the bejeebers out of me, but I’m going to have to try and work on my visualization. But how do you, as a parent help these teenagers when the only thing you ever get is Eeyore on the end of [humpha 00:35:02], humpha, humpha? When you ask, “How’s your day,” and you hear, “Humpha, humpha, humpha,” and you ask what’s wrong, the answer is, “Humpha, humpha, humpha.” How do you as a parent try and help your child put all of these things in place? Jacqui Letran: 35:18 That’s a brilliant question and I think the first thing that parents need to do is just pause and look inward at themself first. What are you bringing into the table? Are you presenting yourself as this very open, accepting parent, or are you judgmental? Is your child comfortable speaking to you? Can they trust that they can tell you anything and have your guidance versus punishment? And we as parents look inward and start working on ourselves and recognizing what we bring to the table and what we don’t bring to the table, and work on the areas that we can work on and improve, that relationship will change significantly. We bring judgments, we bring our fear, we bring our past experiences, and we put them up on our children. Our children are not us. And even if they went through the exact experience that we went through that was so painful for us, for the child it might be completely different. It might be very neutral, you know, because they have different belief systems and their mind is focusing on different things. So be willing to check your emotions at the door and use that calming statement all the time. Focus on being able to stay calm and being open to your children. The other thing that I worked with parents on a lot is that a lot of my clients have this belief of their children’s actions are reflections of who they are as parents. We need to separate that. Our children’s actions are their children’s actions. It has nothing to do with us. Even with the absolute best, most perfect parent, if there’s ever one, your child is who they are and they’re going to react differently. So be willing to recognize that their action is not a reflection of who you are. Their action is their experience. So the more you can separate that, the more you can stay calm and open with your children, the better conversations you will have. Lisa Linfield: 37:15 So, you go through the process, you look at yourself, you try and separate yourself. Can you get a child to open up, or do you just have to wait? Now, I’m not suggesting that there’s no consequences. I am a true believer of allowing the child to experience true consequences. But I also believe in fostering that safety net. So one thing that parents can do if they’re not fully comfortable with this whole idea is to just start practicing in their mind. Practice having the child come and giving like some kind of horrible news, and practice being calm. Practice being open. Practice being accepting. If you can start having those thoughts in your mind and feel good in your body, you will react differently to your children. Lisa Linfield: 39:15 You talk about setting positive goals for yourself, and how we can set these positive goals. One of the challenge with it is the fact that we do beat ourselves up. Half the time we actually set goals that aren’t as high, because we’re terrified of missing them. How do you believe we set positive goals? Jacqui Letran: 39:35 I think it’s really important to start with really understanding the why behind your goal. A lot of us, we do things because we think we should be doing these things, or society expects us to do this, or our partner, or our bosses, and we have goals that don’t have a lot of meanings to us. So if you’re looking to set goals, really spend some time on discovering your why. Why is this goal important to me? When you don’t have a clear understanding of your why, it’s really hard for you to do it. If you are working to fulfill a goal that your partner wants, or your boss wants, or you think society want from you, and you have no interest in it, you have no passion behind it, you don’t have any drive behind it, it’s going to be difficult for you to achieve. So spend the time, it is quality time to spend that time thinking about, what is it that you truly want? And even ask yourself, “If I have all the resources I need, what is it that I really want?” Play big. Be willing to dream a little bit there, and get that big, overarching picture, something that excites you, something that when you think about this goal, that it brings a smile to your face, it brings energy into your being. Lisa Linfield: 41:38 The challenge of how big to set the goal, you know, you said dream a little. Should our goals be big, or should we try and breed as much success in the beginning and then try and set bigger goals? Jacqui Letran: 41:52 I think the first thing for me is that there is no should. Your goal is what you want and what is important to you. You know, for me, my goal might be, “Well, I want to make $500 by the end of this month.” And another person might look at me and go, “$500? That’s nothing. That’s a tiny, obsolete goal.” But if that goal’s important to me, that’s where I want to set my intention. If my goal is to make $5 millions, I set my intention differently, won’t I? Lisa Linfield: 42:19 Absolutely. And I guess one of the challenges also is time. If it’s a year, 10 years, or by the time you’re 80, that might just be kind of a different thing, or not. What do you think? Jacqui Letran: 42:33 In setting goals, I like to use the S.M.A.R.T. goals system, and S.M.A.R.T.’s an acronym. S stand for specific. You need to get very specific on your goals. You know, if you say, “I want to be rich,” what does that really mean? That’s not specific enough. M stands for measurable, and that kind of ties in. “I want to be rich.” Well, what does rich mean? “Well, I want to have $3,000 in my bank account by a month.” Or, “I want $3 millions in my bank account in two years.” A is really important, and that is attainable by you given the resources you have. You know, I am 5’1″, Asian, and my goal is to be a 5’8″ blonde, not going to happen. Well, the blonde part, I guess I can dye. Lisa Linfield: 43:18 And you can have some really big platforms. Jacqui Letran: 43:21 But I’m still not going to be 5’8″. I just have really big platforms. But it has to be attainable by you, given the resources you have. So when you’re looking at your goal and you’re at that A part and you’re missing resources, the next step is to ask yourself, “Where can I get this resource? Who do I know that can help me here? What classes do I need to take? What else do I need to have in place for me to achieve my goal?” R is relevant. Again, it goes back to why is this important to you? Why do you want to achieve this goal? How is it relevant to you? And T is timed. Because if you have a goal of, “I want to be a millionaire,” well, by when? Is it by tomorrow, which is unrealistic. Is it 50 years from now? So when you set goals, you want to have those five pieces in there. Specific, measurable, attainable by you, relevant to you, and timed. Lisa Linfield: 44:16 That’s wonderful. My last question to you is, one of your books is titled, Five Simple Questions to Reclaim Your Happiness. Lisa Linfield: 44:25 Is it as simple as that? Jacqui Letran: 44:26 It could be as simple as that if you let yourself be. Again, you’re the boss of your mind and whatever it is that you choose to focus your attention on will be the reality you create. In the beginning, if you go from being incredibly negative, choosing to be happy is not the most natural thing, but it is a practiced skill. Anything … you know, like if you want to get good at tennis, you don’t go out in the field one time and expect to be perfect. You practice and you practice, and you get a coach, and you practice some more. Same with choosing happiness. Same with being calm. Same with focusing on positivity. Same with attaining your goals. It requires constant practice. Lisa Linfield: 45:10 Wow. So for all our listeners out there, how would they get ahold of your books? Jacqui Letran: 45:17 The easiest way to get ahold of me and my books and the podcast is go onto my website, which is jacquiletran.com, J-A-C-Q-U-I-L- E-T-R-A-N. And at the jacquiletran.com site, I have links to my books, I have link to the podcast, I have links to the programs that I offer. Lisa Linfield: 45:40 That’s fantastic. Well Jacqui, thank you so much for sharing so freely your insight. I really appreciate it. It’s been a fascinating conversation, really. I wish you all the success in the future. Jacqui Letran: 45:51 Thank you so much for having me on, it was a wonderful experience. Lisa Linfield: 45:55 Self-sabotage and the terrible thoughts that we have inside our own head are some of the biggest inhibitors to each of our success. I hope that all of you will go over to Jacqui’s podcast and listen to a few more episodes that’ll help us each to live our best life possible. I’m Lisa Linfield and this is Working Women’s Wealth. Have a great week.